Jamie Squire/Getty ImagesThe Rays were left without a true starting pitcher on their active roster for a few days after trading away ace Chris Archer and an injury to Jake Faria, but from thanks to the unorthodox strategy the team has employed this year, that might not be much of an issue. The Tampa Bay Rays were temporarily left without a single starting pitcher on their active roster after trading away ace Chris Archer ahead of the deadline. While most teams might see this as a problem, the Rays have embraced unorthodox pitching arrangements all season. The Rays’ willingness to throw traditional baseball methodology out the window has made them one of the most compelling teams to watch. With the AL East now a two-horse race between the Boston Red Sox and New York Yankees, the Tampa Bay Rays were left to try and reload at the deadline, trading away ace starter Chris Archer to the Pittsburgh Pirates in exchange for younger talents Austin Meadows and Tyler Glasnow. While there’s nothing strange about a team that is out of the playoff hunt trading away their top pitcher, the move did put the Rays in a rather odd position – thanks to Archer’s departure and a slew of injuries, Tampa Bay was left without a single true starting pitcher on their roster. Coming into the 2018 season, the Rays had just three true starting pitchers on their roster – Archer, Jake Faria, and Blake Snell. The day that Archer was traded, both Faria and Snell were already on the 10-day DL, leaving the Rays without a single starter. 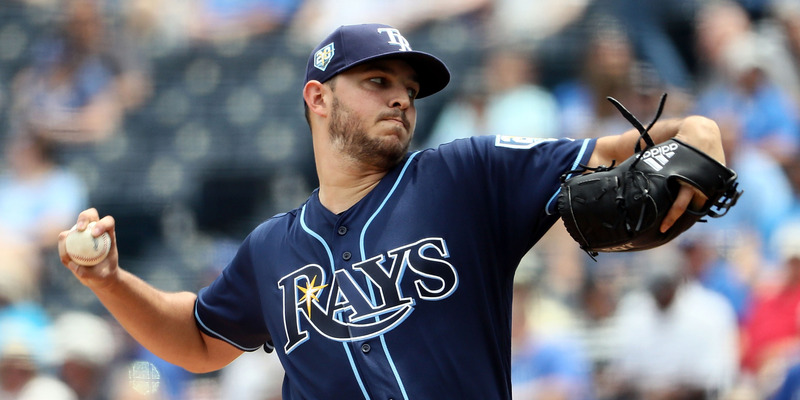 The problem didn’t last long, as Faria was ready to return to the team just a day later, but in all likelihood, the Rays didn’t see the situation as much of a problem either way. After the Rays’ top three starting pitchers, they have been quite experimental on the mound this year, using platoons of middle and long relievers to get through games. They even toyed with the idea of an “opening” pitcher, with reliever Sergio Romo became the first pitcher since 1980 to start and pitch at least one inning on consecutive days earlier in the year. Since the Archer trade, the Rays have adjusted their roster to look a bit less absurd. Faria is back in the rotation, and Snell is set to return on Saturday. Glasnow, who was a reliever for the Pirates, has shifted roles for Tampa Bay, and made his first start of the 2018 season on Wednesday, pitching for three innings while allowing just one run and notching five strikeouts, to help the Rays en route to a 7-2 win over the Angels. Now 20 games back on the division, the Rays season certainly hasn’t gone the way they have hoped, but they have undeniably been one of the most entertaining groups to watch in all of baseball.